Inspired by the complexities of living fully in all worlds at once, Dichotomy meditates on and celebrates the dual nature of existence. Composed of “ribbons of energy” that seek to capture the process of engaging all levels of being in order to be fully human, the sculpture reflects the natural strength and quiet majesty inherent in integrating the various levels of existence. As a result, the figure inhabits a serene meditative space, fully embracing a dichotomy of existences: anima and animus, male and female, conscious mind and unconscious mind, waking and dreaming. 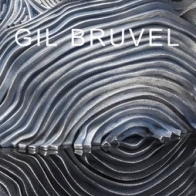 Gil Bruvel is proud to announce his association with the Russell Collection Fine Art Gallery in Austin, Texas. Russell Collection is a world-class gallery filled with museum quality art who set out to offer something different to the serious art collector in central Texas. Russell Collection Fine Art has assembled a permanent collection that includes approximately 100 original works spanning the history of art from 1600 to the present, making it the premier visual arts gallery in central Texas. Located in the heart of one of the most unique and diverse cities in the world, the gallery uses its collection and resources to provide educational and cultural experiences for the people who live in, work in, and visit Austin. Russell Collection Fine Art offers an outstanding schedule of special exhibitions and lectures for patrons. 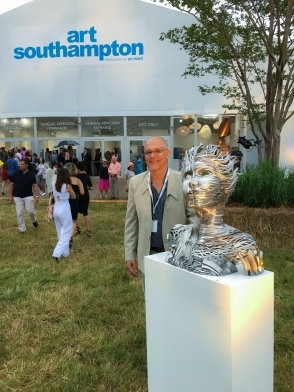 Gil Bruvel in attendance at Art Southampton, the most important destination for acquiring the finest investment quality works of contemporary and modern art along with design. 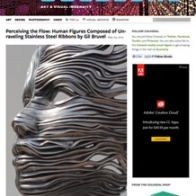 For the price of an App ($1.99) you can download this eBook about Gil Bruvel's stainless steel sculptures and mixed media, including his Flow Series, new Chess Set as well as his new Cubist Series. During his more than thirty-year career, Gil Bruvel has passionately followed an ever-changing, organic flow of artistic expression as it has moved through a series of mediums and forms. Each one is a reflection of the artist’s aesthetic sensibility and thoughtful perspective at the time, while continuously remaining open to the inner nudges inherent in a truly creative life. And in each approach—from surrealist-inspired and fantastical imagery to three-dimensional functional and sculptural art, to the current Flow series—he has drawn on threads of creative stimulus and artistic mastery that began very early on. As the son of a renowned cabinetmaker in southern France, Gil absorbed precision of hand and an eye for design. Studies in the fundamentals of drawing and sculpture began when he was nine. Later, apprenticeship in an art restoration workshop provided an excellent art history education with intimate, hands-on insight into techniques of the Old Masters as well as a fluency in 20th-century art. By the time the young artist set up his own studio, he was combining these and other creative sources with a finely honed eye for recurring patterns and motifs in the natural world. In 1990 he settled in the United States and now lives near Austin, Texas. 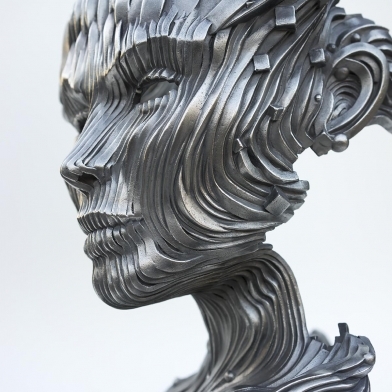 Gil Bruvel is a “Jack of all Trades” of the art world. Born in 1959 in Australia, he soon moved back to his roots in the South of France. The influences of the iconic landscapes and light of Provence soon led him to art studies, encouraged by his father who introduced him to wood craft. Gil spent years restoring French monuments, concurrently with his own art experiments. He tried his hand at bronze sculpture, mixed media and functional art, creating incredible pieces of design such as chandeliers and chess sets. Gil also mastered painting, playing with 3D effects that reminds of great names such as Dali and Bosch. His weakness for imaginary worlds can also be found in his sculptural work, clearly marked by surrealism and fantasy. Now based in Texas and exhibiting his work all over the world, Gil Bruvel has dedicated himself to pushing the boundaries of contemporary art and beauty even further. His latest series called The Flow features intricate masterpieces. 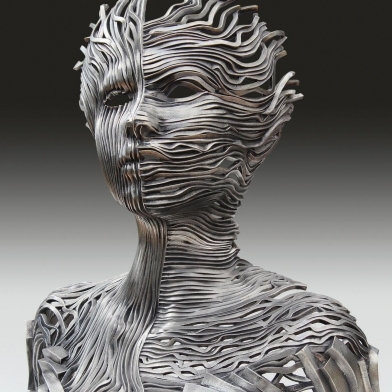 Using sinuous ribbons of cast stainless steel, he has created dynamic and graceful portraits of women and couples. His “ribbons of energy” express the fluidity of life and discuss the relationship between the physical plane, atomic constitution and metaphoric realms. Beautiful and moving, his creations induce a reflection on the ephemeral nature of our lives, their connections with others and nature. Texas-based sculptor Gil Bruvel manipulates ribbons of cast stainless steel to create spectacular figurative sculptures for his Flow series. Each form is energized with fluid, flowing lines of metal that appear all-at-once sturdy and fragile. Each metallic strand serves as a piece of Bruvel's captivating puzzle, all of which work in unison to depict "the natural strength and quiet majesty inherent in integrating the various levels of existence." Bruvel's collection often features a sense of duality. In his piece titled Dichotomy, the artist presents the bust of his figure constructed in two patterns. One half of the sculpture consists of vertical lines, while the other half is composed of horizontal ribbons. Each half incorporates his signature style of fluidity, making it seem as though the malleable material is forcibly windswept, causing ripples in its shape. The artist's statement reads: "Bruvel’s ribbons of energy may flow in parallel streams, yet they convey the subtle and complex human intersections of beauty and pain, inner and outer, the ephemeral and the eternal now." 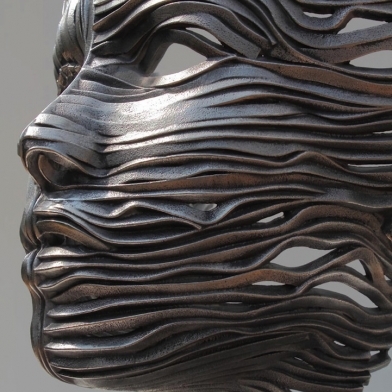 Though cast from bands of stainless steel ribbons, these figurative sculptures by Texas-based artist Gil Bruvel seem more fluid than solid, as if the wind could simply blow them apart. The works above are all part of the artist’s Flow series that he says are meant to reveal “an essential underlying fluidity that exists simultaneously within the physical, quantum, and metaphoric realms.” Bruvel was born in Sydney, Australia, in 1959 and he began learning the basics of sculpting at the age of nine before embarking on an artist career that now spans nearly 40 years. If you’re in San Francisco next month you can catch Bruvel’s work at Chloe Gallery starting June 30th. the unfolding time required for each split-second decision, every perfect turn and move. its magic. We were momentarily part of its magnificent flow.